Agent– A person acting on behalf of another, called the principal. Appraisal– An expert judgment or estimate of the quality or value of real estate as of a given date. Assessed Value– The valuation placed upon property by a public tax assessor as the basis for taxes. Bill of Sale– An instrument which transfers title to personal property (chattels); a “Deed” transfers real property. CC&R’s: Covenants, conditions and restrictions– A document that controls the use, requirements and restrictions of a property. Certificate of Reasonable Value (CRV)– A document that establishes the maximum value and loan amount for a VA guaranteed mortgage. Certificate of Title– A document signed by a title examiner or attorney stating that the seller has a good marketable and insurable title. Commission– Payment to a real estate broker for services performed. Condominium– A form of real estate ownership where the owner receives title to a particular unit and has a proportionate interest in certain common areas. The unit itself is generally a separately owned space whose interior surfaces (walls, floors and ceilings) serve as its boundaries. Contingency– A condition that must be satisfied before a contract is binding. For instance, a sales agreement may be contingent upon the buyer obtaining financing. Deed– A formal written instrument by which title to real property is transferred from one owner to another. Also, “conveyance”. Deed of Trust– Like a mortgage, a security instrument whereby real property is given as security for a debt. However, in a deed of trust there are three parties to the instrument; the borrower, the trustee, and the lender (or beneficiary). Due-On-Sale Clause– An acceleration clause that requires full payment of a mortgage or deed of trust when the secured property changes ownership. Earnest Money– The portion of the down payment delivered to the seller or escrow agent by the purchaser with a written offer as evidence of good faith. Equity– The interest or value which owner has in real estate over and above the debts against it. 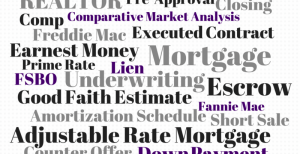 (Sales Price – Mortgage Balance – Equity). Escrow– A procedure in which a third party acts as a stakeholder for both the buyer and the seller, carrying out both parties’ instructions and assumes responsibility for handling all of the paperwork and distribution of funds. Federal National Mortgage Association (FNMA)– Popularly known as Fannie Mae. A privately owned corporation created by Congress to support the secondary mortgage market. It purchases and sells residential mortgages insured by FHA or guaranteed by the VA, as well as conventional home mortgages. Fee Simple– An estate in which the owner has unrestricted power to dispose of the property as he wishes, including leaving by will or inheritance. It is the greatest interest a person can have in real estate. Fixture– What was formerly personal property which is now permanently attached to real property and goes with the property when it is sold. Graduated Payment Mortgage– A residential mortgage with monthly payments that start at a low level and increase at a predetermined rate. Hazard Insurance– Protects against damages caused to property by fire, windstorms, and other common hazards. Home Inspection Report– A qualified inspector’s report on a property’s overall condition. The report usually includes an evaluation of both the structure and mechanical systems. Home Warranty Plan– Protection against failure of mechanical systems within the property. Usually includes plumbing, electrical, heating systems and installed appliances. Joint Tenancy– An equal undivided ownership of property by two or more persons. Upon the death of any owner, the survivors take the decedent’s interest in the property. Lien– A legal hold or claim on property as security for a debt or charge. Listing Contract– Between a home owner (as principal) and a licensed real estate broker (as agent) by which the broker is employed to market the real estate within a given time for which service the owner agrees to pay a commission. Also, “listing agreement”. Loan Commitment– A written promise to make a loan for a specified amount on specified terms. Loan-To-Value Ratio– The relationship between the amount of the mortgage and the appraised value of the property, expressed as a percentage of the appraised value. Market Value– The highest price which a buyer, ready, willing and able but not compelled to buy, would pay, and the lowest price a seller, ready, willing and able but, not compelled to sell, would accept. Basis for “listing price’, or “asking price”. Mortgage– A lien or claim against real property given by the buyer to the lender as security for money borrowed. Mortgage Life Insurance– A type of term life insurance often bought by mortgagors. The coverage decreases as the mortgage balance declines. If the borrower dies while the policy is in force, the debt is automatically covered by insurance proceeds. Negative Amortization– Negative amortization occurs when monthly payments fail to cover the interest cost. The interest that isn’t covered is added to the unpaid principal balance, which means that even after several payments you could owe more than you did at the beginning of the loan. Negative amortization can occur when an ARM has a payment cap that results in monthly payments that aren’t high enough to cover the interest. Origination Fee– A fee or charge for work involved in evaluating, preparing, and submitting a proposed mortgage loan. The fee is limited to 1 percent of FHA and VA loans. PITI– Principal, interest, taxes and insurance. Planned Unit Development (PUD)– A zoning designation for property developed at the same or slightly greater overall density than conventional development, sometimes with improvements clustered between open, common areas. Uses may be residential, commercial or industrial. Point– An amount equal to 1 percent of the principal amount of the investment or note. The lender assesses loan discount points at closing to increase the yield on the mortgage to a position competitive with other types of investments. Prepayment Penalty– A fee charged to a mortgagor who pays a loan before it is due. Not allowed for FHA or VA loans. Private Mortgage Insurance (PMI)– Insurance written by a private company protecting the lender against loss if the borrower defaults on the mortgage. Prorate– To allocate between seller and buyer their proportionate share of an obligation paid or due. For example a prorate on real property taxes, fire insurance, or condominium fee. Purchase Agreement– A written document in which the purchaser agrees to buy certain real estate and the seller agrees to sell under stated terms and conditions. Also called a sales contract, earnest money contract, or agreement for sale. Realtor– A real estate broker or associate active in a local real estate board affiliated with the National Association of Realtors®. Regulation Z– The set of rules governing consumer lending issued by the Federal Reserve Board of Governors in accordance with the Consumer Protection act. Survey– A map or plat made by a licensed surveyor showing the results of measuring the land with its elevations, improvements, boundaries, and its relationship to surrounding tracts of land. A survey is often required by the lender to assure a building is actually sited on the land according to its legal description. Tenancy in Common– A type of joint ownership of property by two or more persons with no right of survivorship. Title Insurance– Protects lenders and home owners against loss of their interest in property due to legal defects in title. Title Search or Examination– A check of the title records, generally at the local courthouse, to make sure the buyer is purchasing a house from the legal owner and there are no liens, overdue special assessments, or other claims. Transfer tax– State tax, local tax (where applicable) and tax stamps (in some areas) required by law when title passes from one owner to another.